Did you notice your car’s engine making a knocking sound? Or noticed a drop in acceleration? Chances are that your car’s Intake Air Temperature Sensor (IAT) is damaged and that should be fixed immediately to avoid any serious damages to the engine. In this article, you will learn the symptoms and the meanings of a bad intake air temperature sensor. Let’s Begin with the symptoms. When the IAT sensor fails or gets damaged, it can show some symptoms through which the driver can easily conclude that the problem is with the specific component. First you will find a troubleshooting table, further down you will find more information. Due to a faulty sensor, the PCM may think that the air outside is cold or warmer than it actually is. A false signal may cause the PCM to miscalculate the air and fuel mixture resulting in a drop in acceleration. 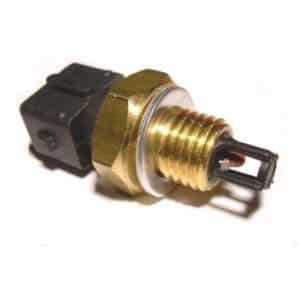 Some engines rely on a signal from the IAT sensor to initiate the cold start injector program. If the sensor sends the wrong information, the cold start injector might not work resulting in a hard cold start. In some cars, the PCM uses air temperature to control the operation of EGR Valve. Due to a faulty IAT sensor, the function of the EGR valve can be affected too. In normal condition, the engine computer makes a constant adjustment in the fuel and air level mixture to ensure maximum fuel efficiency. The engine control unit relies on the information from the IAT sensor and if a false signal is sent, the fuel efficiency decreases significantly. A damaged Intake Air Temperature Sensor usually triggers two trouble codes: P0112 or P0113. The P0112 code indicates that the IAT sensor is operating at a low voltage and reporting a temperature of about 300 °F (149 °C). The P0113 code is caused by a high circuit voltage and means that the IAT sensor is reporting a temperature of about -38 °F (-39 °C). What is an Intake air temperature sensor? 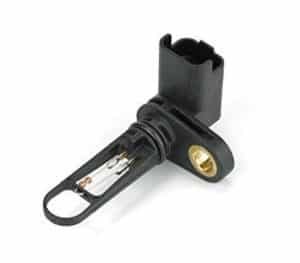 The Intake air temperature sensor or IAT sensor has the core function of monitoring the temperature of the air that is entering the engine of your vehicle. This information is very useful for the engine control unit or ECU for many functions and calculations, such as calculating the air density for effective ignition timing and fuel efficiency. 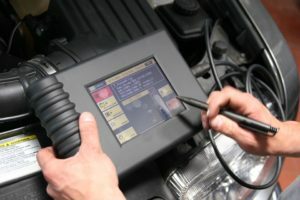 The computer system of your engine or the PCM requires this information in order to stabilize and regulate the air-fuel ratio for the combustion engine. As a result, it ensures optimum combustion and efficient fuel consumptions. The principal science behind evaluating these sensed readings is that the hotter air is lighter than the colder air in density, therefore the cooler air would need relatively more fuel in order to burn with the fuel that is injected in the engine. If the fuel and air mixture ratio is not correct, the vehicle will not perform to its full capacity and the fuel consumption may also be increased. With this information, the computer system of the vehicle automatically regulates the fuel injection by altering the injection pulse to inject more fuel when required. it is especially important to maintain the proper air-fuel ratio during the hot winds of summer as well as the cool nights of winter as the temperature extremes can greatly affect the performance of your vehicle by changing the density of the air that is entering the vehicle. It is also very helpful in maintaining the emission levels of your vehicle. Where is the IAT sensor located? The location of the Intake air temperature sensor is an easily arguable subject due to different locations in a variety of designs. The best way to locate the IAT sensor in your vehicle if to refer to the service manual that is provided by your manufacturer. The intake temperature sensor is often inbuilt in your mass air flow sensor! The Intake Air Temperature (IAT) sensor of your vehicle is usually installed in the lefthand side of the intake manifold. It could be on the throttle body attached right to the intake manifold. The diagnostic procedure of checking if the IAT sensor has gone bad is relatively easier and you can do it yourself if you have some basic knowledge and the tools available to you. You will usually require a multimeter, a scanning tool, wire piercing probe and some tools to reach it. it is better if you test and diagnose the problem before attempting to replace the IAT sensor. Here is a quick step by step guide that you can follow to diagnosing a bad IAT sensor. Locate the sensor and clean the area with brake cleaner or something like that. Connect the OBD2 scanner to your car. Check the live data and check the temperature of the IAT sensor. Typically the temperature readings should be 10 degrees more or less than the vehicle’s ambient temperature depending on the outside temperature and the temperature of the engine. If the readings are not realistic, there could be a problem with your IAT sensor or the wirings to it. Check once again if the readings are fixed with your OBD2 scanner. If the readings change, there might be corrosion inside the connector for the IAT/MAF sensor. If the temperature is over 300 degrees or do have a low unrealistic value, check the wires of the MAF sensor/IAT as they can be damaged. Since the Air Temperature Sensor is a solid-state component, it cannot be adjusted. However, you can clean the sensor if it is dirty or clogged and it will be in a good working condition again. To clean the sensor, remove it from the intake manifold then use an electronic cleaner to spray the affected area. Avoid using any other type of cleaner as it can damage other components or plastic housing. Installing a new IAT sensor is fairly simple and requires some basic tools including a pair of gloves, a new IAT sensor, and safety glasses. Start with locating the IAT sensor which can be found in the air intake boot, at the intake manifold or integrated with the MAF sensor. Inspect the IAT sensor and remove its electrical connector. Remove the IAT sensor by either pulling it straight or unscrewing it. Reconnect the electrical connector and the battery terminal. The average replacement cost of IAT sensor comes between $60 and $110. The labour cost is between $20 and $70, while the parts itself cost between $100 and $150. The cost of IAT sensor replacement can vary greatly depending on the type and the manufacturer of your vehicle when you are buying the parts. On average for most vehicles, you will have to pay a sum of $163 for the replacement of an Intake air temperature sensor. The price range for most vehicles on average is between $80 to as much as $270. For some vehicles, you can get the replacing part for as low as $7 while all the other added cost or around $100 to $150 would be for the mechanic and labour cost. This greatly varies with the mechanic you are dealing with. By doing it yourself following an easy to replace guide you can save up on all the labour cost involved in it. It could, but it’s most likely something else like the throttle body or the crankshaft sensor. Also if the car is running very rich, it could be the problem. Read the trouble codes if possible if you havn’t yet! Can the IAT cause low rpm in the morning and when AC is on? It’s most likely the “Idle control valve” (or throttle body if you don’t have an idle control valve). Clean the throttle body or the idle control valve and try again. When plugged into my obd2 scanner and reading the live data, the IAT Sensor Temperature reading never goes much above what the outside temperature is. So even after ~15 minutes of driving my IAT sensor reads 59 degrees Fahrenheit, but my engine coolant temperature is at 165. From my understanding, some of the ambient engine heat should be affecting what the IAT sensor reads, correct? Thus the IAT sensor reading should be at least somewhat closer to the Engine Coolant Temp than a measly 59 degrees which is almost the same as the outside temperature. I have a 2006 Audi A3. I would test the IAT sensor but don’t own a DMM. I’ve read the live data twice, once on a 17 minute drive at freeway speeds, and another 15 minute drive at city speeds. Both times the live data readout only showed the IAT maybe a few degrees above the outside temperature. The scanner has no codes regarding the IAT sensor/circuit. Short Term Fuel Trim and Long Term Fuel trim for Bank 2 both were both pegged at +25% which means a lean condition in Bank 2. I’m not a car guy and all of this is new to me, I’m thinking I have a bad IAT and a maybe a vacuum leak somewhere on bank 2? My car idles rough sometimes, has decreased fuel mileage, and occasionally I can smell raw unburnt gas outside the vehicle while idling. I’m not a car guy and all of this obd data is new to me so any insight is appreciated. Codes my car has pulled collectively over the past couple months. Never did these codes occur all at once. In this scenario, it seems like your IAT is fine. With these codes, I would absolutely start looking for any vacuum leaks around the intake. What engine do you have? Seems pretty strange with an Audi A3 with 2 banks. VR5 engine? Check for vacuum leaks or any broken PCV Valve. I have 2001 Lexus RX300, I replaced the fuel pump & the fuel pressure regulator, the car still want start, I hooked up my OB11 SCANNER & found a code ; p0110, my question is can IAT Sensor stop the car from starting? If you have access to the scanner, check the value of the intake air temperature sensor while the car is running in the scanner. Intake temperature sensors do not normally make the car to not starting. I would recommend checking the fuel pressure with a gauge to make sure you have ~3 bars on ignition. If not, you can check if you get any RPM signal in the scanner. If not, there might be a problem with a crankshaft sensor or camshaft sensor. Also make sure that the immobilizer is OK.
Hi! On my BMW E60 M5 since I have bought it (1,5 years, almost 30k km driven already) I have an issue with slightly rough idle, but only on a warm engine. The issue is more noticeable in case the engine idles a lot e.g. in a traffic jam. Possible to feel then some vibration as well. Mass air flow values on idle are almost identical on both banks. About 18-19 kg/s if I remember correctly. the know the car cant start code is p1113 iat help cant locate the iat sensor in this car.